Braking is easily the most practiced, feared, discussed, tried, faltered art in motorcycling. Every biker has kissed the tarmac in a very wrong way one time or the other, just because a sudden brake was applied and the wheel locked. It has happened a million times and like it or not, it would happen again. Honda has been one manufacturer that has been very focused about this area of motorcycling, which can be testified with the fact that the founder of Honda, Mr. Soichiro Honda, applied for a patent of his design of an ABS way back in 1959, when Honda was not into automotive. Inspiring confidence on the motorcycle of an average rider. Clearly Honda is NOT talking about racers or professionals or dudes who think they are a magician and the brake lever is their magic wand. The Average Rider - people like me and most of you out there. For providing Controlability, Honda came with Disc Brakes, for providing Convenience, Honda came with CBS or Combined Braking System. It is this third point of Inspiring Confidence on the motorcycle of an average rider, where ABS finds it's way into the Super Sports class of motorcycling. Honda took one step more towards this direction and gave us the amalgamation of CBS and ABS, the C-ABS - Combined - Anti Lock Braking System, and not only this, the C-ABS on the Honda Fireblade and Honda CBR 600, is Electronically Controlled C-ABS. So, what is actually an Electronically Controlled C-ABS? With the amount of responsiveness a Super Sport motorcycle generates as the rider dials in the throttle, a precise and sophisticated Electronic Control over the C-ABS system gains paramount importance towards Honda's goal of providing that immaculate braking experience to the rider. It's basically a Brake-by-Wire system that converts the hydraulic pressure generated by the brake fluid due to the application of the brake lever or the pedal, into electrical signals which are fed into the Power Unit. A computer then computes the brake force distribution to the front and the rear braking units to fine tune the ABS operation. In order to provide a smooth braking experience, the electronically controlled C-ABS, implements high precision brake fluid control in order to prevent wheel lock and minimize vehicle vibration and brake lever pulsing. One of the greatest advantage of the electronic control comes when the rider is applying the rear brake. 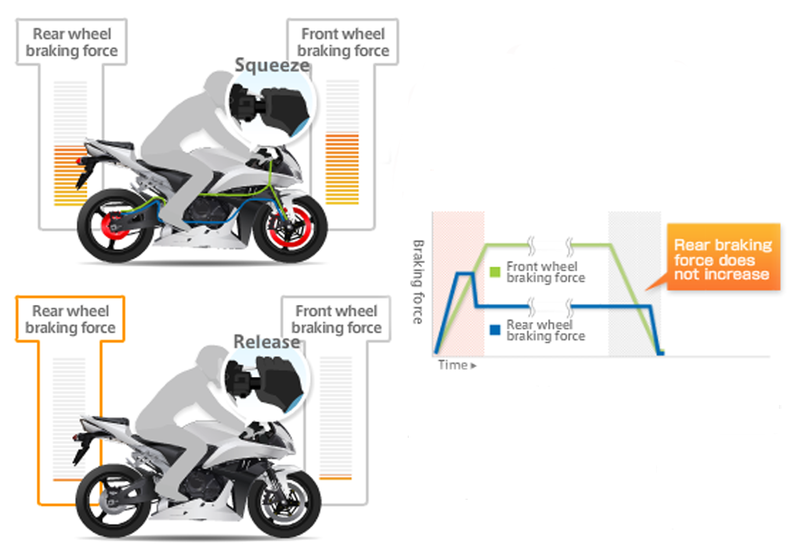 Application of the rear brake does not engage the front brake until the electronic controller senses rear wheel locking. It's only when the rear brake begins to lock, that the brake pressure is transferred to the front wheel. This allows the rider to use the rear brake as a normal non-linked brake for superior control during high speed riding, specially during track days, as this does not come in between the suspension settings and steering control. On the other hand, when the rider tries to use the front brake, the electronic control senses if the front brake has been applied. Once the electronic control senses that the front brake has been applied, the braking force is distributed automatically between the front and the rear brakes and both the brakes are modulated on activation and subsequent release for accurate braking and to provide the most outstanding Super Sport motorcycling. 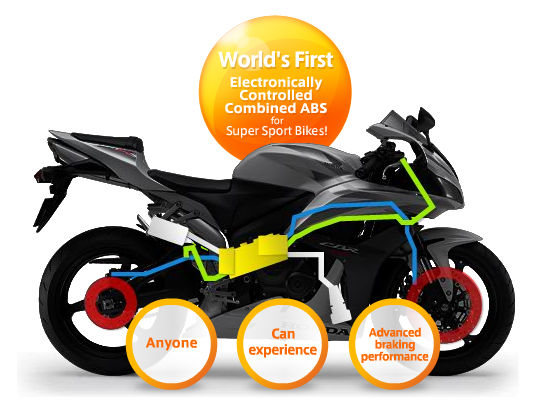 No doubt that Honda has done a wonderful with the development of the Electronic C-ABS. So, what went wrong with the Honda CBR 250R that MotorcycleUSA.com found the C-ABS rather dangerous on it? A close analysis of the overall ride report from MotorcycleUSA.com gives us a hint of what might actually be going wrong. The Honda CBR 250R has a very light front end. So, when the C-ABS modulator distributes the braking pressure to the front braking unit in the event of the rear wheel lock, the front end tends to dive. The steering geometry makes the CBR 250R very light footed, less planted and very eager to corner. So, given a lean in a corner, if the rider tries to back it in, which essentially spins the rear slower than the front, and the wheel locks, then the rider is surely going down as the front would dive at lean. So, essentially what we are seeing that it's the overall front end geometry that's to be taken into consideration here. The CBR 1000RR and the CBR 600RR are full blown, true blue Sport bikes, which have a way different geometry and which complements the Electronic C-ABS. Hope you guys find the description of Honda Electronic C-ABS an interesting and let me your thoughts if Honda made it a mistake by having the Electronic C-ABS go into the CBR 250R considering the kind of geometry the bike has. Interesting read. Enjoyed it. I wouldn't mind ABS. But C-ABS is not for me, at least not for the kind of riding I do... grasslands, gravel, dust, river-crossings. Don't ask me why! The reason is obvious. Thanks a lot Ken Da for dropping by. Well yeah, for off roading, definitely C-ABS is not the thing. Even ABS won't do justice to off roading as it would be too much automatic control which is definitely not welcomed in that genre.